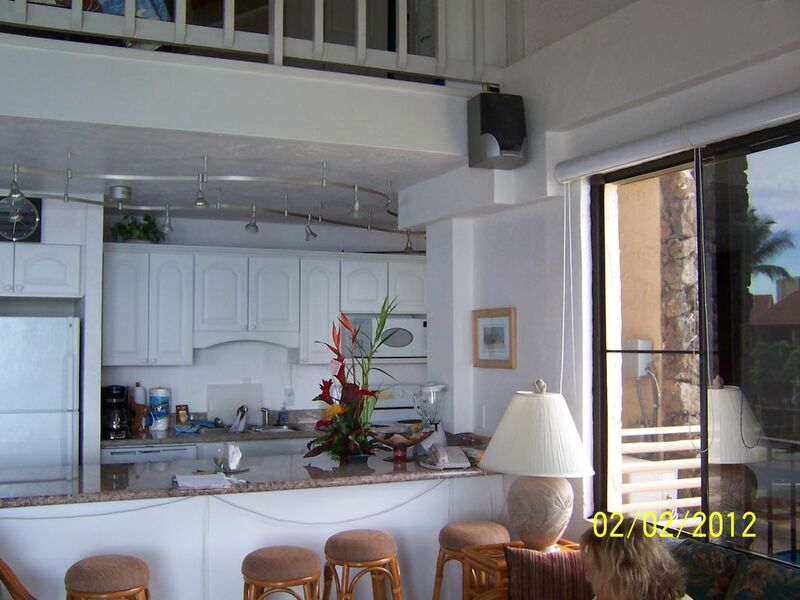 Beautiful corner unit with wrap-around lanai, top floor, 40 feet from the ocean. Fabulous sunsets right from our lanai - Ice is just inside. This unit has an elegant kitchen with granite counter tops and dishwasher. Also included is a washer and dryer and two bathrooms. Paradise!!! HAS THE BEST VIEW OF ANY OF THE FRONT UNITS. CAN SEE THREE ISLANDS FROM THE LANAI. As soon as you walk in the door you immediately see and hear the ocean. The water is literally no more than 100' from the lanai. The unit is well kept (a little dated) but very clean and well stocked. This is a great location near a grocery store, restaurants and a very nice fish market. The grounds and amenities are excellent with two pools and each pool having 6 barbeques. Upon landing in Maui we made a Costco stop and picked up steaks, fish and other foods for the week which saves tons of money for the week. The two bedroom two bath unit allows comfort for 3 or more staying in the condo. We will be back. Absolutely beautiful view of the ocean. The condo is right on the ocean. You can hear the waves crashing against the shoreline. Beautiful sunsets and rainbows right on the balcony. Thank you for your review, we are delighted that you enjoyed your stay at our condo in the wonderful Papakea Resort. We will be posting pictures of the updated interior after our stay in February. We invite you to stay again. Just finishing up our two week stay in this wonderful oceanfront condo. Best location ever, and we even saw whales from the lanai. Property is well furnished and mainatained, and one of the best equipped condos that we have rented. Our young granddaughter loved staying in the loft bedroom and having her own walk-in granite and tile shower. Recommend Royal Lahaina Luau, Quicksilver Dinner Cruise, Road to Hana Tour and dining at Whaler's Village. Mahalo!